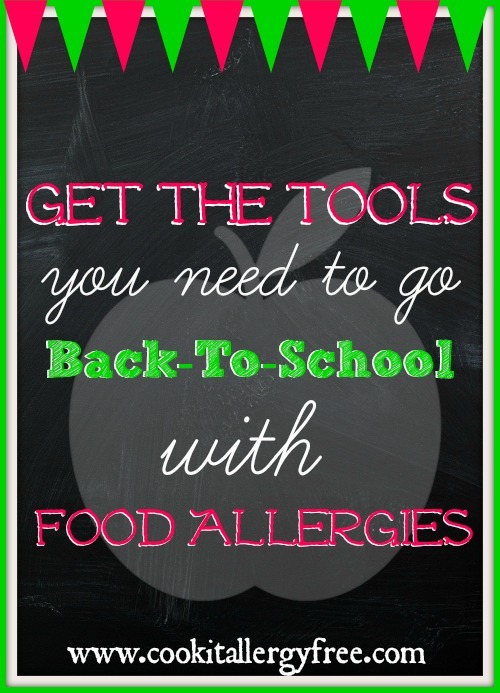 A Perfect Tool for Going Back-To-School With Food Allergies! I hate school parties. And treats in classrooms. And all things food-related at school. I hate that my children can’t partake in eating 99.99999999% of whatever is usually present at these food-centered events. So…hate might be a strong word. I don’t even let my children say it. And the only other time I really use that word is when referring to anything related to vomit. And the stomach flu. I really hate those. And while I absolutely love my children’s school…and I DO mean looove. I do not like having to think about all of the times that food is going to be in the classroom because of their food allergies/Celiac Disease. Of course, both of my boys have airtight container of special treats that they keep in their classrooms. And they both know they get to pick from them any time there is a birthday celebration in class, or a holiday party, or a reward is being given out to the entire class, or Billy gets a new dog, or… well, you get the idea. But, it is still hard to control and make sure they are being kept safe. SO, I decided I was going to make their time (and mine) a little easier. 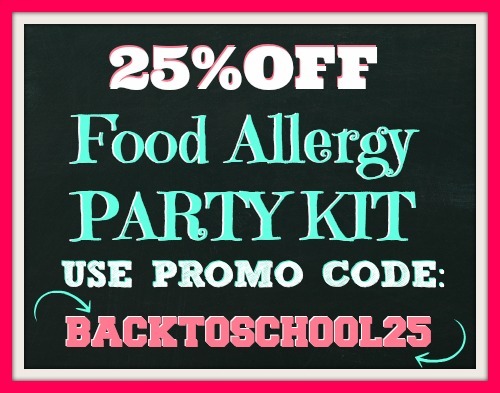 Hence, the birth of my Food Allergy Party Kit and Food Allergy Handbook. The Kit has tools to help let people know what treats are Allergy Safe and will help you to get through all of these food-centered celebrations. 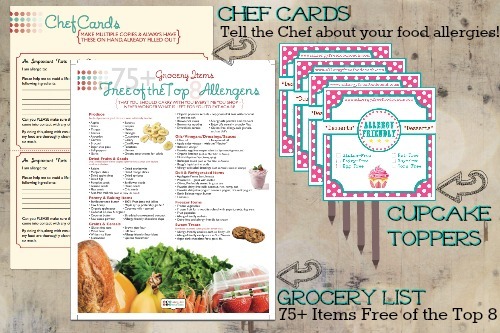 It has allergy-friendly cupcake toppers, Recipe Cards, Potluck Cards, Allergen Cheat Sheet cards on a ring, an Allergy Friendly Shopping List (free of the top 8), Chef Cards for when eating out, and so much more. And every piece is done on on beautiful, thick, high-quality card stock. 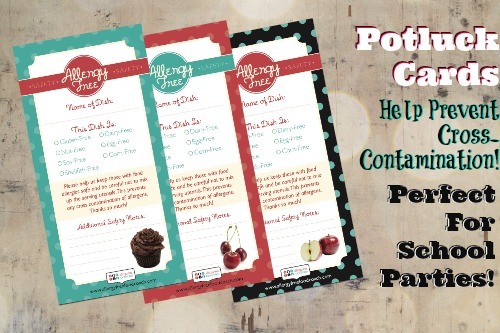 * 30 Potluck Cards (10 of each design) to tell what your dish is free of and how to prevent any cross-contamination. 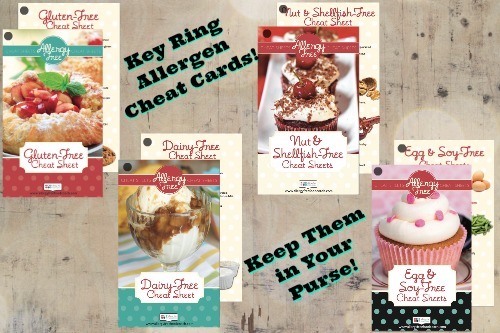 * Allergen Cheat Cards on a key ring. They tell where all your allergens are hiding. Keep them in your purse, take them to the Grocery Store, and be able to shop with confidence for your food allergies. 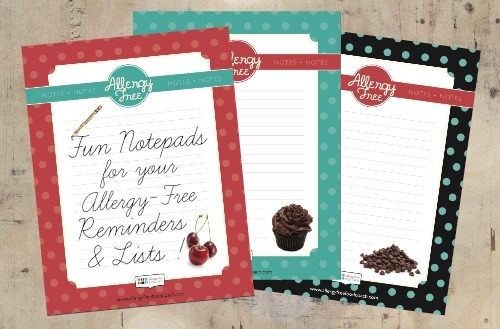 * Three Notepads for all of your Allergy-Free Grocery Lists and Reminders and Notes for your family and friends! * 1-Dozen Designer Cupcake Toppers to show off which of your baking creations are Allergy-Friendly! BUT FOR A LIMITED TIME, you get an ADDITIONAL 25% OFF that price. So you are getting the entire package for ONLY $29.95! You can click the button below and get yours today…. So, make your year just a bit easier. 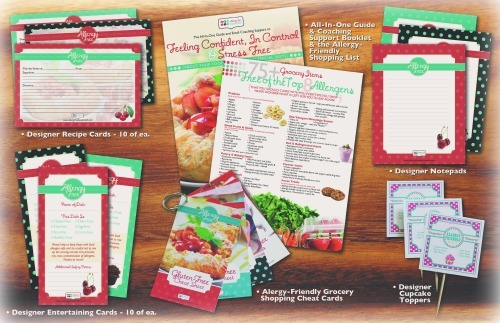 This kit is great for all types of social gatherings, potlucks, holiday parties, and even just day-to-day life. 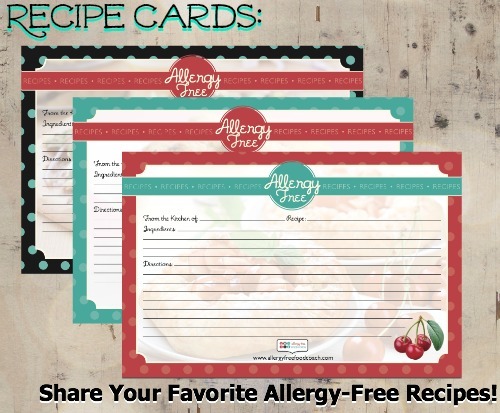 It is also a perfect gift to give to anyone you know with food allergies! And the Handbook is jam-packed with every bit of information you need to make your life with food allergies just that much easier! Get your Kit today! Just enter BACKTOSCHOOL25 at checkout! Just amazed at your hard work and beautiful presentation on this matter. Perfect timing for those busy parents who need these smart ideas. What a GREAT Idea!!!!! Would have loved this when my kids were in school. This will make it so much easier for everyone to navigate food allergies. Great job Kim!!! This is the coolest kit ever Kim! I love it. What a fabulous idea and so pretty! You amaze me woman! This is the greatest idea! I’m off to throw a party 🙂 Well done. I think my readers will really love this kit.